Mangaluru, April 15, 2018: The Congress today released its first list of 218 candidates for the May 12 Karnataka Assembly elections, which includes the names of Ramanath Rai (Bantwal), UT Khader (Mangaluru), JR lobo (Mangaluru South), Modideen Bava (Mangaluru North), Sakunthala Shetty (Puttur), Vasanth Bangera (Belthangady) and Dr B Raghu (Sullia) from Dakshina Kannada district. Pramod Madhwaraj (Udupi), Rakesh Malli (Kundapur), Vinay Kumar Sorake (Kapu), K Gopal Poojary (Byndoor) and Gopal Bhandary (Karkal) were in the list from the Udupi district. Chief Minister Siddaramaiah had his way despite naysayers and has been given the ticket for the Chamundeshwari assembly segment where the Janata Dal(S) and the BJP have vowed to defeat him. The High Command and several of Siddaramaiah’s supporters reportedly asked him to switch to the “safer” Badami seat from Bagalkote district that is dominated by his community members, the Kurubas. Siddaramaiah is said to have proposed that he will contest both but was reportedly asked to choose one, after party seniors Mallikarjun M Kharge and Veerappa Moily objected to him standing from two constituencies. So he dropped the plan to contest from Badami, which has been given to a newbie and instead decided to stick to his old constituency of Chamundeswari, which elected him five times between 1983 and 2006. He lost twice there in 1989 and 1999. Siddaramaiah’s son Yatheendra, a political novice has been given the ticket from Varuna, which his father represented in 2008 and 2013. Other sons and daughters include: home minister Ramalinga Reddy’s daughter Sowmya (Jayanagar), law minister T B Jayachandra’s son Santosh (Chiknayakanahalli), Kolar MP K H Muniyappa’s daughter Roopa Shashidhar (KGF). However, public works minister H C Mahadevappa’s son Sunil Bose, who was asking for the Nanjangud seat, has not been accommodated. The list prompted Union minister D V Sadananda Gowda to tweet: "Siddaramaiah’s son gets ticket. Ramalinga Reddy’s daughter gets ticket. Jayachandra’s son gets ticket. Why doesn’t Mahadevappa’s son get ticket. INC always Snubbed Dalits."? (Mahadevappa is a Dalit leader). Congress state unit campaign committee chairman and power minister D K Shivakumar’s relative H D Ranganath gets the Kunigal ticket. The wives of sitting MLAs Qamarul Islam and Rudre Gowda, who died, Fatima and Kirtana respectively, get the tickets for their husbands’ seats of Gulbarga Uttar and Belur. Fifteen women and the same number of Muslims get the party ticket, many of them in new constituencies which have not had women or Muslim representation earlier. Two Christians and two Jains have made it to the list. 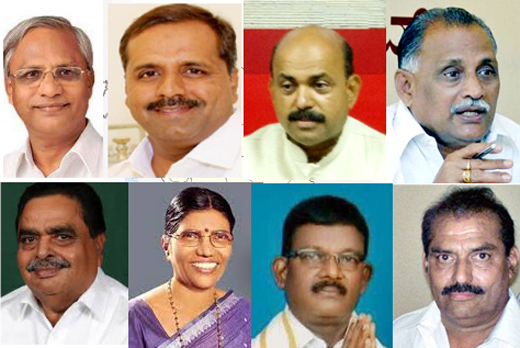 Three sitting MLCs, H M Revanna, M R Seetharam and Srinivas Mane have been given tickets to contest for the assembly. MLC V S Ugrappa from Molkalmuru, his former secretary ?Bhimrao ?Shinde from Aurad and another secretary Hira Naik from Mayakonda, were not given the ticket.